Each year bands across the country salute our troops and our country at halftime. It is almost guaranteed that your favorite band will do some kind of patriotic salute at a game. And every year we find ourselves waiting impatiently to see the Auburn Marching Band do theirs. Each year they elevate their game and blow our minds. This year was no exception. We heard their fantastic sound and watched them dazzle the Clemson fans during our trip their earlier this season. 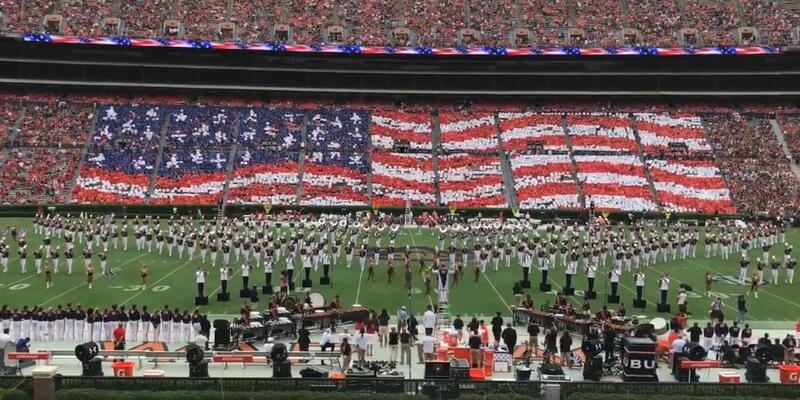 They truly are a gem in the SEC and this year's patriotic show is one of the best you will ever see. The AUMB teamed up with the US Army Herald Trumpets for the show and also had the back side of the stadium participate in a card stunt. The result is a halftime show that we will probably talk about for years to come. It's a show that you must see. Enjoy this fantastic performance by the Auburn Marching Band and the US Army Herald Trumpets. Please share so all band fans can enjoy this fantastic tribute out country. Not sure how you can top that next year Auburn, but I guess we thought the same thing last year.